I have published two books to help people. 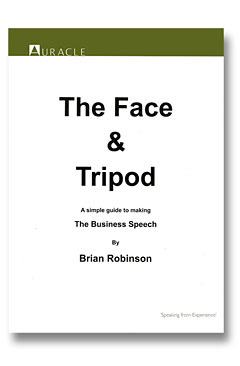 The Face & Tripod will transform your presentations and public speaking. Every Word Heard is a booklet that takes all the sting out of enunciation. Those links take you to the e-books at Amazon.co.uk. If you are in another part of the world, merely go to your local Amazon site and search for the titles. If you click this link you will go to the right place at Amazon.com. The Face & Tripod is also available in printed form via the Auracle Website. The links take you to Amazon’s Kindle section, because they are both e-books. If, like me, you don’t have a Kindle you can download the Kindle app free to your desktop, laptop, tablet or phone in fact most electronic toys. For my part, that is the principal joy of an e-book: you have it with you always.